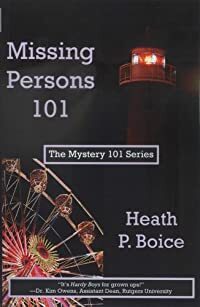 Missing Persons 101 by Heath P. Boice, a Mysterious Review. Review: Heath P. Boice introduces Dr. Doug Carter-Conners, Dean of Students of a small college on the New Jersey shore, in Missing Persons 101, the first book in the academically themed Mystery 101 series. When a student, Jessica Philmore, the daughter of a wealthy family, disappears, Dean Doug (as he prefers to be called) is under tremendous pressure to find her before negative press begins to affect the college. But the information available to him doesn't make sense. The missing girl's roommate, a practicing witch, says she is her best friend but then claims to be responsible for her disappearance. Jessica's boyfriend states he's in love with her, but seems strangely unconcerned that she's gone. Even Jessica's mother, who is all but hysterical upon arriving at the college demanding action, suddenly vanishes without a word to anyone. A chance encounter with a fortune-telling gypsy at a local fairground suggests Jessica's disappearance may not be what it seems on the surface, leading Dean Doug to look in another direction, one that may cost him his life. Missing Persons 101 is a pleasant mystery that won't tax the reader's intellect too greatly. Dean Doug, who is far too politically correct (which no doubt is a prerequisite for working at an institution of higher learning in the US these days) and who comes off as something of a wimp, is in many ways less interesting than the more richly drawn secondary characters. This is actually an important consideration for a series: if the supporting players aren't sufficiently well rounded, it's hard to sustain long term interest in the main character. The missing persons plot is well thought out, but rather weakly executed. Dean Doug happens to be in the right place at the right time to pick up all the important clues giving the impression that he is stumbling through his amateur investigation rather than reasoning through it. And the red herrings, such as the dead student who washes up on the shore, are too quickly discarded as irelevant to the case leaving little suspense in the end. As the first book in a series, Missing Persons 101 does a good job of introducing the characters and setting. Maybe future cases will provide more of a challenge for Dean Doug than the one presented here. Acknowledgment: Windstorm Creative provided a copy of Missing Persons 101 for this review.